Tiger Woods' Masters Tournament history is filled with wins, high finishes, and tournament records. Woods remains a serious contender at Augusta National Golf Club, even though his recent record in The Masters includes several injury-induced absences. Tiger Woods has won The Masters five times, making him one of the most successful players in that tournament ever. Woods holds or shares a slew of Masters tournament records, including lowest score and largest margin of victory. 2001 Masters: The final round began with Tiger Woods, David Duval and Phil Mickelson at the top of the leaderboard. The final scores were close—Woods by two over Duval, by three over Mickelson—there really wasn't that much mystery throughout the final round about who would win. Woods was in control throughout. This was the tournament at which Woods finished off the "Tiger Slam," winning his fourth consecutive major. 2002 Masters: Woods began the final round tied with Retief Goosen at 205. But the Goose shot 74 in the final round to Woods' 71, and that three-stroke cushion was Woods' final margin of victory. With this victory, Woods became just the third back-to-back winner in Masters history, joining Jack Nicklaus and Nick Faldo. 2005 Masters: In the third round, Woods chased down and passed Chris DiMarco with a streak of seven birdies in a row. But in the fourth round, DiMarco chased down Woods, beating Tiger by three strokes on the day. The two went into a sudden-death playoff—the seventh sudden-playoff and 13th playoff overall in Masters history—but Woods quickly ended it with a 15-foot birdie putt on the first extra hole. But what will forever be remembered is Woods' amazing chip-in on the 16th hole of the final round, a chip-in that had to happen, it turned out, for Woods to force the playoff. 2019 Masters: Woods entered the final round trailing the leader by two strokes, and ended it winning by one stroke. His shot 70 in the final round and holes 13-16 were the key. Woods was 3-under on those holes birdies on Nos. 13, 15 and 16. He bogeyed the final hole, but since Woods teed off those hole with a 2-stroke edge, it didn't matter. It was his first win in any of the majors since the 2008 U.S. Open. Woods holds or shares many tournament records at The Masters. 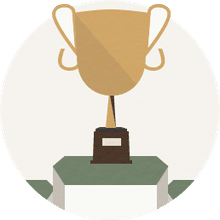 In the scoring department, for example, Woods' 12-stroke victory in 1997 is still the biggest margin of victory in any Masters. In 2005, Woods won despite trailing by seven following the first round, tied with Nick Faldo for biggest comeback after 18 holes. 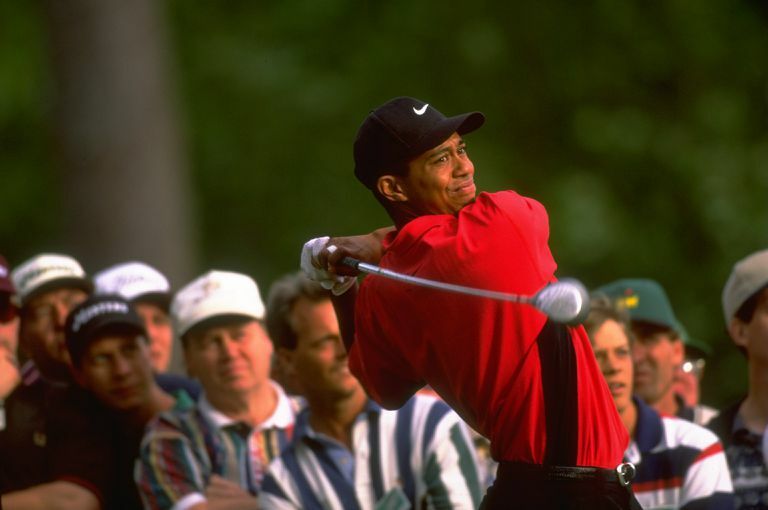 In 1997, Woods was 16-under-par on the back nine for the tournament, scoring 30-32-33-33. That's the record. Woods holds the solo record for lowest middle 36 holes with 131 totals in both 1997 and 2005 (and both times 66-65). In 1997, his final 54-hole total was 200 (66-65-69), still the record. And his 270 winning total that year has been matched only once, by Jordan Spieth in 2015. Another record set in 1997 that Tiger still holds: youngest Masters champion. He was 21 years, 3 months and 14 days old at the time. In 2005, at age 29 years, 3 months, 11 days, he became the youngest fourth-time winner. And when he won in 2019 at 43, he became the second-oldest winner. In the category of eagles/birdies: Woods' four total eagles in the 2010 Masters shares the tournament record. He also shares the mark for consecutive birdies with seven in a row during the third round in 2005. And Woods shares the record for most birdies over consecutive rounds with 16 combined in the second and third rounds in 2005. The 9-stroke lead Woods held after the third round in 1997 is the largest 54-hole Masters lead. His career scoring average of 70.86 is the best ever for golfers with at least 51 rounds played in The Masters.